Well, we joined something I never thought we would. KOA campgrounds. Yep. We are not RVers and never plan to be. But this year I was sleeping on the job and didn't book our labor day yurt trip to Ft. Stevens State park in time. We couldn't come to terms with missing out on going there this year so I joined KOA and booked that instead. Then suddenly the weather was good and I, on a whim, decided to see if we could escape to a KOA on the coast at the last minute. We could. We booked 1 night at the KOA in Bay Center/Willapa Bay. I had no idea what to expect. The yurt was spacious, warm, and brand new! 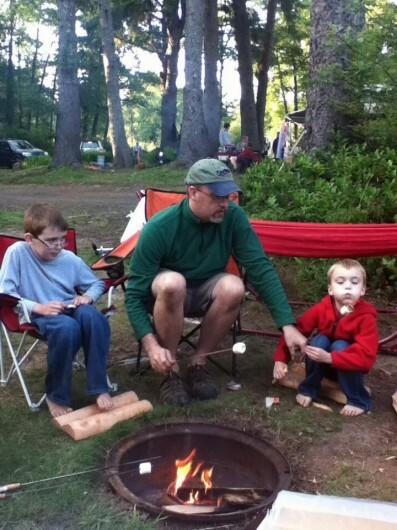 We loved having free wi-fi while sitting around the campfire. The folks that run this KOA are a couple who have lived there for something like 30 years and they take pride in it. John asked what there was to do in the area and they suggested clamming. John's ears perked up! We found out that kids can get up to 40 clams per day for free without a license. That was enough for John to drag poor Orion late at night out to the beach to clam. Then he woke Ollie up at the crack of dawn the next day to meet his quota of 40. John also acquired a license of his own and got 80 for both days. So we ended up with 160 clams which eventually we turned into a huge vat of clam chowder, which eventually we pawned off on friends. Still, it was a fun adventure.